"These are though to be the original pancake. Serve them hot with maple syrup. They are also known as hoecakes. Serve hot with honey and butter." Cream the cornmeal, salt, and butter together. Add the milk and enough water to make a moist but firm batter. Drop by large spoonfuls onto a hot greased griddle, and flatten slightly with the back of a spoon. When brown, turn and cook the other side. See how to make traditional Boston brown bread with molasses. 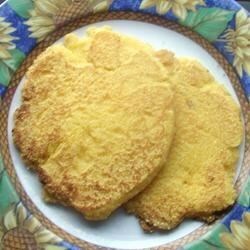 This recipe works so much better than other johnnycake recipes I have tried. The key is to get the hot water at or near boiling, and otherwise, it's pretty foolproof. I make Fried corn bread all the time,but this had to be the best I have ever made. Served these for breakfast on a cold Scout campout, the scouts couldn't get enough and have added it to their breakfast menu for winter camping. As expected these are a bit on the dry side. Serve with gigantic glasses of milk.